Every month we summarize our simulation cases. No deep dive here, just the top 5 takeaways from each case (blast injury, electrical injuries, pelvic fractures, pediatric burns). 1. Blast injuries comprises a multitude of different potential injuries secondary to an explosion. An explosion is an event that occurs when a substance rapidly releases energy and produces a large volume of gaseous products. The extreme compression of molecules by this change in energy creates the blast wave that moves outward from the epicenter of the blast. Injuries seen from an explosion are dependent upon the size of the explosive charge, the nature of the explosive, the container, any shielding or protective barriers between the victim and the explosion, the surrounding environment, the method of delivery, and the distance between the explosion and the victim. 2. The first priority of the emergency physician who is faced with the aftermath of an explosion is to activate the hospital’s external disaster plan. Are you aware of your hospital’s disaster plan? Make sure your hospital has one and you know how to activate it. Clear the ED of all possible patients by either discharge or admissions before the first patients of the explosion arrive. Hospital administration should simultaneously cancel all elective surgery cases, clear the recovery room, and clear as many intensive care beds as possible. 3. Trauma from explosions have traditionally has been categorized according to the following scheme and can help the emergency provider anticipate potential injuries. 4. The air/lung interfaces are very susceptible to a blast wave. Lung injury is the most common fatal injury from an explosion. Blast lung (BL) is the most common fatal injury caused by a primary blast among initial survivors. Pulmonary barotrauma from a pressure wave includes pneumothorax, pneumomediastinum, pulmonary contusion/hemorrhage, and air embolism form bronchopleural fistulas. BL is characterized by a triad of dyspnea, bradycardia, and hypotension. Other common findings include wheezing, cough, hemoptysis. It is the most common fatal injury caused by the primary blast among the initial survivors of the explosion. A simple frontal chest x-ray is diagnostic for most cases of pulmonary barotrauma from blast. Blast lung produces a characteristic “butterfly” pattern on chest x-ray . OUr POOR Mannequin Takes such a beating for our residents! A blast wave compresses tissues and the resulting forces exceed the tensile strength of the material and causes shearing of vascular beds, pulmonary contusions, and gastrointestinal hemorrhages as the tissues are compressed and expanded. Blast lung should be anticipated. Gastrointestinal injury (mesenteric bleeding, bowel contusion, colonic perforation) from a blast wave is inconsistent in presentation and may not be apparent externally. 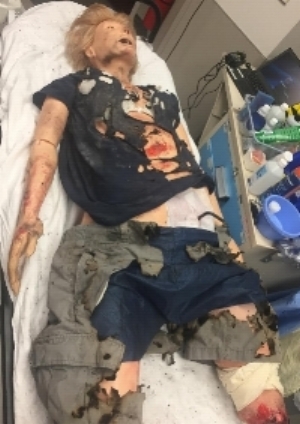 Secondary blast injury (much more common than primary blast injury) caused by bomb fragments and other debris propelled by the explosion can have very minor appearing external wounds. Use radiographs judiciously to find foreign bodies. Tertiary blast injuries and deceleration by impact into a rigid structure can cause any type of blunt trauma. Miscellaneous quaternary injuries could include burns from fire or radiation, crush injury associated with structural collapse, poisoning from carbon monoxide or other toxic products of the explosion, and inhalation of dust or chemicals from the explosion. 1. 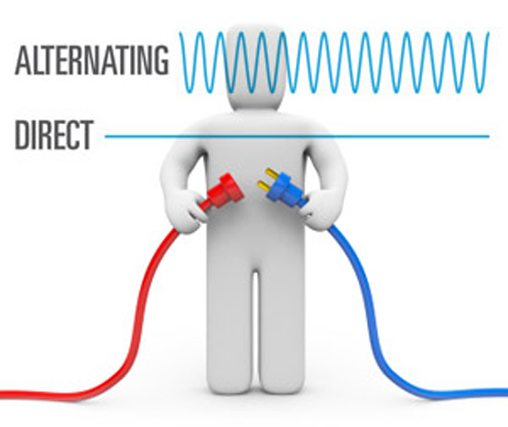 The damage incurred during an electrical injury depends upon the voltage, the resistance of tissues, the amperage (or current strength), the type of circuit (direct or alternating current), the current pathway, and the duration of contact. Amperage is the volume of water. Resistance is the diameter of pipe (bone, tendon and fat have highest resistance and typically worse damage). Voltage is the difference between entrance and exit pressure of pipe. 2. Electrical injuries are traditionally divided into high-voltage vs low-voltage exposures, AC vs DC circuits. Understanding these distinctions can help you anticipate potential injuries. Electrons flow back and forth through a conductor in a cyclical fashion. Found in most offices and and homes. Causes tetany that prolongs contact with source, making it potentially more dangerous. It has been suggested that ventricular fibrillation is more common with low-voltage AC injuries as it increases likelihood of current going through the heart during vulnerable relative refractory period . Used in batteries, automobile electrical systems, high voltage power lines. Causes a single muscle contraction that throws victims from electrical sources. Asystole is seen more often with DC high-voltage injuries. Direct contact with body (can cause massive underlying damage to soft tissue and bone that may not be apparent from the surface). Flash injuries (caused by arc between source and patient; can generate temps up to 5000C (9032F) and ignite clothing). Common household circuits in the United States and Canada, which provide 120 volts for general use and 240 volts for high-power appliances. Tend to cause small, well demarcated contact burns at entrance and exit site. 3. Electrical injuries have three main mechanisms of injury. External trauma still may not represent. It has been suggested that ventricular fibrillation is more common with low-voltage AC injuries, whereas asystole is seen more often with DC high-voltage injuries . Overall, exposure to low-voltage AC is most likely to cause cardiac consequences as it increases the likelihood of current flow through the heart during the vulnerable relative refractory period. High-voltage injuries may largely spare the skin surface but cause massive damage to underlying soft tissue and bone, necessitating escharotomies, fasciotomies, or amputations [2,3]. Damage to intima of vessels may result in thrombosis and occlusion immediately or over several days. Cardiac damage is possible from the transcardiac passage of electrical current. Incidence of spinal cord injury following high-voltage electrical trauma ranges from 2-27% . Cataracts and hearing loss have also been described. Exposure to DC causes a single muscle contraction that throws the victim away from the electrical source. AC causes tetany that prolongs contact with the source, making it potentially more dangerous. 4. Delayed arrhythmias are rare and tend to occur only in patients with an arrhythmia on presentation, as has been shown in multiple prospective and retrospective trials encompassing both low-voltage and high-voltage injuries [4-10]. Obtain an initial ECG in the ED on all patients with an electrical injury, regardless of the voltage. Traditionally, low-voltage electrical exposure who have a normal ECG on presentation and no loss of consciousness or arrhythmia can be discharged without cardiac monitoring. Patients with history of loss of consciousness, documented arrhythmias either before or after arrival to the ED, ECG evidence of ischemia, or who have sustained a high voltage electrical injury should be admitted for additional monitoring. All patients should receive an ECG and be placed on cardiac monitor to screen for cardiac injury and arrhythmias. Urinalysis and CK levels should be obtained with high voltage injuries to assess muscle injury/rhabdomyolysis. Extremity burns should be followed closely for possible fasciotomy (progressive neurologic dysfunction, vascular compromise, increased compartment pressures, vascular compromise). The fluid requirements of patients with electrical injuries are generally much greater than those of patients with thermal burns. Because cutaneous burns from electrical injuries do not represent the full extent of injury, formulas for fluid resuscitation based on percentage of body surface area burned are not applicable. Fluid resuscitation should maintain a urine output of 1.0 to 1.5 cc/kg per hour. the closed chest. Am J Cardiol. 1962;10:223-233. 3. Varghese G, Mani MM, Redford JB. Spinal cord injuries following electrical accidents. Paraplegia. 1986;24(3):159-166. 4. Rai J, Jeschke MG, Barrow RE, Herndon DN. Electrical injuries: a 30-year review. J Trauma. 1999;46(5):933-936.
injury with a management protocol. Postgrad Med J. 2002;78(919);283-285.
multicentre study. Emerg Med J. 2007;24(5):348-352. 7. Bailey B, Gaudreault P, Thivierge RL, Turgeon JP. Cardiac monitoring of children with household electrical injuries. children. Am J Emerg Med. 2000;18:671-675. 10. Purdue GF, Hunt JL. Electrocardiographic monitoring after electrical injury: necessity or luxury? J Trauma. 1. Assess the mechanism of the pelvic injury (lateral compression, AP compression, vertical shear) and determine the fracture pattern. “Open Book” pelvic fractures requires immediate external fixation (pelvic binder). 2. Open book pelvic fracture is a life threat – a “Circulation” issue/life threat in our primary survey. Assess for unstable pelvic fracture in your primary survey and address it here with a pelvic binder. 3. Bony stability does not equal hemodynamic stability. 4. Initial management should include application of a pelvic binder, crystalloids, and early blood. If the patient is unresponsive to these first tier interventions, mobilize the next tier of treatment (angiographic embolization). Consider initializing the massive transfusion protocol. 5. Pelvic trauma is a multidisciplinary sport (think of all the consultants that might be needed to help manage pelvic injuries (i.e. trauma surgeon, urologist, orthopedist, IR). Mobilize help early. 1. Burns in patients < 14 yo are consistently among the top causes of injury induced mortality (#3 after motor vehicle accidents and accidental drowning). Scalds (from hot liquids) comprise the majority of pediatric burns. Prevention of burn process (remove all affected clothing, cooling with cool water/saline). 3. Your history and physical exam should focus on the type of burn, burn depth, burn severity and % Total Body Surface Area (TBSA). What type of burn was it (scald, flame, contact, electrical, friction, sun)? 4. Evaluate for and treat concomitant trauma associated with burns. 5. The primary pillars of burn treatment includes airway management, fluid resuscitation, wound care, and pain management. Blister intact and < 1 cm2, leave intact. Burns are painful. Administer pain medication liberally. 1. Shields BJ, Comstock RD, Fernandez SA, et al. Healthcare resource utilization and epidemiology of pediatric burn-associated hospitalizations, United States, 2000. J Burn Care Res. 2007;28(6):811-826.
area chart drawings. Burns. 2000;26(2):156-170. 6. Jamshidi R, Sato TT. Initial assessment and management of thermal burn injuries in children. Pediatr Rev. 2013;34(9):395-404. 7. Vloemans AF, Hermans MH, van der Wal MB, et al. Optimal treatment of partial thickness burns in children: a systematic review. Burns. 2014;40(2):177-190.